An incredibly versatile and popular compressor, the MXR Dyna Comp is great for evening out your dynamics and has been used on more hit recordings than we could mention here. 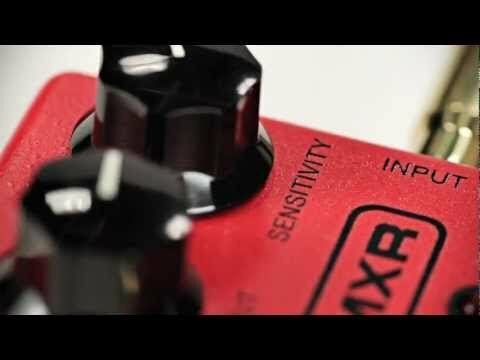 Ideal for adding a slightly percussive hint to your clean sound or lengthening your lead sustain, the MXR Dyna Comp can be seen on many pedal boards worldwide. Two two dials give you all the control you could ask for here. The output knob controls the level coming out of the Dyna Comp and the sensitivity knob sets the compression threshold so you can vary how noticeable the effect is. The MXR Dyna Comp is a true bypass compressor so doesn't alter your tone when turned off meaning you can use this pedal live and in the studio without worrying about any negative tonal effects. A bright LED is prominent on the front of the pedal too making it ideal for on stage use so you can see when it's on or off. You can power the Dyna Comp with a 9V battery or a power supply (sold separately) or an optional power adapter.